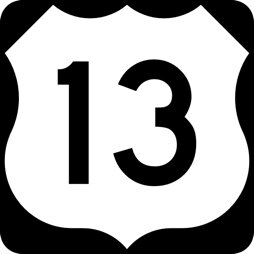 US Highway 13, commonly known as Route 13, is the major north-south highway on the Eastern Shore. It extends the full length of the Delmarva Peninsula and beyond. During the summer the route is heavily traveled, but congestion isn't usually a problem. If you need a place to stay, see our list of Eastern Shore Route 13 hotels at the bottom of this page. 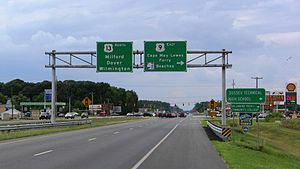 Route 13 connects the largest cities on the Eastern Shore and Delmarva, including Wilmington, Dover and Salisbury. It also passes through or near countless small towns and villages. Discover the towns of the Eastern Shore. Because of haphazard development and related slow-downs on the northern end of Route 13, Delaware built Delaware Route 1 as a faster alternative. It's a limited access toll-road and is definitely the fast way to go from south of Dover to Wilmington. It is also the quick route to the Delaware beaches. On the southern end of Route 13 is the famous Chesapeake Bay Bridge-Tunnel. This engineering marvel spans 17 miles across the mouth of the Chesapeake Bay and includes two tunnels. If you're looking for a place to stay while you're traveling Route 13, here's a list of some of the Eastern Shore hotels located on the highway in Delaware, Maryland, and Virginia. Follow the hotel links for reservations and to confirm details. Holiday Inn Express & Suites Dover - Located on Dupont Highway (that's what they call Route 13 in that part of Delaware). Complementary Express Start Breakfast Bar. Hampton Inn Dover - Located on the highway. One mile from Dover Downs. Free hot breakfast. Outdoor pool. Dover Downs Hotel & Casino - Stay right at Dover Downs, where you'll find a casino, racing (horses and cars), and entertainment. Fairfield Inn & Suites Dover - Free breakfast. Free shuttle to Dover Downs. Indoor pool. Holiday Inn Dover Downtown - On Route 13 (Dupont Highway). Close to Dover businesses. Outdoor swimming pool. Lobby restaurant. Super 8 Dover - Budget lodging with free internet and free continental breakfast. Holiday Inn Express Harrington - Complementary hot breakfast. Free internet. Flat screen TVs. Outdoor swimming pool. Super 8 Harrington - Rooms include microwaves and refrigerators. Free "SuperStart Breakfast Bonanza". Baymont Inn & Suites Harrington - Located across the street from Harrington Raceway and Casino. Free continental breakfast. Indoor pool. A pet-friendly hotel. Hampton Inn Seaford - Located on Route 13 (they call it Sussex Highway in Seaford). Free hot breakfast is included with your stay. The hotel has an indoor swimming pool and a fitness center. Days Inn & Suites Seaford - Value-priced hotel with free breakfast, free wi-fi internet access. Holiday Inn Express Seaford - You get the basic HI Express amenities, including free hot breakfast, free internet, business center, fitness center, and outdoor pool. Hotel is located on Williams Pond. Courtyard Salisbury - Located on Route 13, north of intersection with Route 50. No free breakfast here. There's an in-hotel cafe that serves breakfast only. Hampton Inn Salisbury - Your stay includes a free hot breakfast, free WiFi internet access, and fitness center use. Located near the mall. Motel 6 Salisbury - Budget hotel located on Route 13 near the Salisbury mall. Lots of shopping and restaurants nearby. Microtel Inn & Suites Salisbury - Budget hotel with small but modern rooms, free wi-fi and free continental breakfast. Close to Shorebirds Baseball at Perdue Stadium. Econo Lodge Princess Anne - Free continental breakfast is available in the lobby each morning. Rooms have microwave, refrigerator, and coffee maker. Near the University of Maryland Eastern Shore. Holiday Inn Express Pocomoke City - Free breakfast bar, fitness center, free internet. Located near where Route 13 intersects with 113 and heads out toward the beaches. Restaurants and a Walmart nearby. Days Inn Onley - Located on Route 13 (called Lankford Highway in Virginia) just outside of the towns of Accomac and Onancock. In a commercial section of Route 13 where there is a small congregation of shopping and dining options. Holiday Inn Express & Suites Exmore - One of the chain hotels constructed fairly recently in the Exmore area, which is about halfway down (or up) the Eastern Shore of Virginia. Guests enjoy the usual HI Express amenities. Free hot breakfast bar, free internet, fitness center, business center, indoor pool. Hampton Inn & Suites, Exmore - Studio suites available with sleeper sofa, bar sink, microwave, and refrigerator. Free hot breakfast, free internet access, fitness center, outdoor pool. Shore Stay Suites - Independent hotel close to Cape Charles and Kiptopeake State Park. Suites have full kitchens. Sunset Beach Inn - Located at the southern end of Virginia's Eastern Shore, near the Chesapeake Bay Bridge Tunnel. The hotel is on Route 13 and the property extends back to a sandy beach on the Chesapeake Bay. There's a popular restaurant/bar on the beach that often features live music. There's an RV camping park next door. This property is where the annual Eastern Shore Harvest Festival is held.